Annick Goutal created Sables1 over 30 years ago, and I'm happy to be the one reviewing it here (at long last). 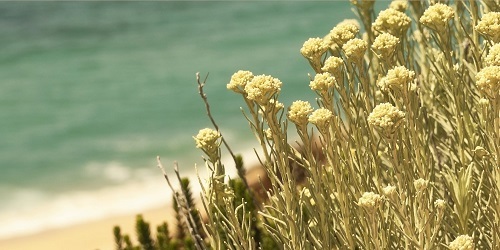 Goutal used the shrublands of Corsica, one of her favorite vacation spots, as inspiration for Sables, whose main ingredient, immortelle (Helichrysum italicum), grows naturally there and is also planted on farms for use by companies such as L'Occitane. Sables was a gift for Goutal's beloved husband, the cellist Alain Meunier; they had met and fallen in love as young music students, then drifted apart for decades before meeting again and marrying. (Grand Amour is another Goutal creation that pays homage to their life together.) Sables represents a perfumer's love for a place and a man...très romantique. Sables was one of the first niche fragrances I bought (and I've owned many bottles over the years). I've not smelled Sables in a long time (from a new bottle, that is) and was almost afraid to sniff it after smelling the recently re-released, tweaked (and scoured) Annick Goutal Eau de Monsieur. If you read old reviews of Sables from the 90s, the words 'overpowering,' 'curry powder,' 'bacon,' 'fenugreek' and 'maple syrup' are repeated over and over. Sables was gutsy. Many reviewers felt it should only be worn at home in order not to annoy or horrify passersby. After trying current Sables, I'm happy to report it's not been given a scrubbing with a heavily soaped loofah mitt; Sables still smells earthy, aromatic and delicious. When Sables hits its stride, it pours forth immortelle with a capital "I"...herbal, sweet, a bit disconcerting at times (with a fleeting, but penetrating, aroma some people compare to the smell of dry piss but that I think smells like a brittle, faded, dried and dusty bouquet of peonies). The sweet part of immortelle is usually described as having the scent of maple syrup, and, in Sables, I certainly smell a note that reminds me of maple sugar (not too dense). Sables' base smells of immortelle-infused amber with a dribble of caramelized brown sugar and mellow sandalwood. From start to end, I enjoy Sables; how it smells at the eight-hour mark is as lovely as its opening and heart. My associations with Sables are firmly set: I wore it when I started college and was living in Los Angeles; Sables makes me feel hopeful, young and strong. I always think of sun and warmth when I wear Sables (the Santa Ana winds! ), so I turn to Sables in hot weather (though in winter when I'm feeling low and worn out Sables is a great 'booster perfume'). Annick Goutal Sables Eau de Toilette has good sillage and lasting power; 100 ml, $149. For buying information, see the listing for Annick Goutal under Perfume Houses. 1. Listed notes of immortelle, sandalwood, cinnamon, vanilla, amber. Note: top images of immortelle italienne via RevelEssence; butterfly found at Wikimedia Commons; middle image of seaside immortelle from Essential Health Magazine. How is it that I’ve never tried Sables? Grand Amour was the first niche perfume I ever bought, 15 years ago. I wore Heure Exquise to my wedding, and my husband bought me Rose Absolue on our honeymoon. I can measure my life in Goutals. “Measure my life in Goutals” – what a lovely sentiment. Elizabeth: sell it to Goutal! HA! I can visualize the ads now…. As an individual who LOVES the smell of immortelle essential oil (I have used it in several of my blends for the maple syrup effect) and a fan of Annick Goutal since the early 90s why haven’t I ever tried this one? After this review I won’t be afraid to sample the current rendition….next time I am in SAKs I will seek it out! I love how you associate Sable with a defining time in your life…that is what perfume is to me……a doorway to past memories….great review!!!!! Chocmarzipan, thanks! You must try Sables ASAP! I tried Sables very early on, and I got everything the ’90s reviewers did; I was horrified and thought for a long time afterward that I didn’t like immortelle. Now that I’ve become familiar with it in some tamer perfumes I should give Sables another try. I can see how immortelle would work in hot weather. Janice…bet your tastes have changed…maybe Sables won’t even faze you now! I’ve only tried the current version and I love it. It’s a comfort scent for me. I haven’t tried it in the heat, but will now after reading your review. I can see it working on warm summer evenings. Elisa, don’t know how this would work in a humid climate, but in dry heat, it’s perfect. That’s a good point, Kevin. Very humid summer days are normal here, and I’ve only worn Sables in cold weather, thinking I might feel smothered by it in the humidity. OTOH, I love Désert du Marocain (misspelled?) in all weather. Although they were both “born” in a dry climate, their elements must respond differently to humidity, at least to my nose or mindset. karen b: I’ve never worn Sables in the “tropics”; would be interesting to see how it reacts in humidity. Everything I’ve ever read about Sables, including this review, make it seem like I’d love it, but nope. I am starting to wonder if the small decant I have is off.???? makes . . . grammar! Amy, if it’s years old I would try to smell it again from a bottle in a store. Love Goutal, and love Sables. It’s good to hear that it hasn’t been tampered with in any major way, and even gladder that it is still available. I can’t believe it’s one of their best sellers. Austenfan…is it? Assuming it must have a european fan base… Like you, I am happy it’s still around. What I meant to say was that I don’t think it sells very well. I actually believe Petite Chérie is their best seller. Austenfan…wonder how Eau d’Hadrien fares these days…. That used to sell really well didn’t it? Kevin, it was your mini-review on the 50 male scents piece that prompted me to get Sables. Whether it is the perfume or the back story, Sables to me is a (psychologically) happy-melancholy scent that I find very comforting and beautiful. It makes me think of being at the seaside in France, but somehow sepia-tinted like it was someone else’s childhood, or something stranded in time that I can never really touch again. Koenigsberg, whew! Glad for the successful match. I’ve been wearing Sables a week for this review and am addicted all over again. I have a 2 ml vial of Sables that I got as a tester in about the year 2009 when I was enthusiastically doing research on past fragrance greats. I can get quite a lot of pleasure from a dab from this vial, so it’s lasted me many years. For all the years that I’d see the 15 or 30 ml small flacons of AG fragrances available for sale, I never saw the nice small size for Sables, which would have been perfect for me. I also love the little bit of Sables herbs and immortelle that used to be in the original lovely Eau de Monsieur. I love the weird herbal qualities of Sables. I am glad to see it reviewed here. Anns, can’t believe it’s taken this long for me to review, considering how much I enjoy it. Good to know! AG was also the first niche line that I tried and still one of my favs. Her perfumes really do communicate l’amour. Noz, I have a soft spot for most of the early Goutals. Kevin- I am curious, which of the early ones do you enjoy? My favorites (before they were reformulated or discontinued) were Folavril, eau d”Hadrien, eau de Camille and Eau de Ciel…..the last one reminding me of my time in Paris in the early 90s where I purchased my first bottle…..
Choco: I like all the ones you mention plus OLD Eau de Monsieur, Eau de Fier, I believe I liked the Charlotte one too. Honeysuckle…I always spray that around the house in spring…. Your review brought back all the reasons I couldn’t stomach Sables… no, nope, nooo way, not for me. But I very much enjoyed the review none the less! Kevin, you’ve convinced me that I should “man up” and at least try Sables. I’ve always been skeered by those old reviews, but now I will instead keep in mind your associations of youth, strength, and hope with this perfume. Thank you for your encouraging review! FearsSables…no more! Hope you enjoy it! I’m glad to see your review of this one. I’ve not tried Sables, but I got a whiff of it on LizzieB one night when we went with our NYC perfume gals to an AG event. It smelled really wonderful on her! And I’ve been meaning to try it on myself since. Some of those descriptive words make it sound like a hard scent to wear, but I’m still game. Limbic: well, at least your husband can “borrow” some when he needs it! Promtly added to my to-sample list! I love immortelle, and it’s always surprised me that it tends to be a polarizing, love-it-or-hate-it scent. Growing up — and then working — around a lot of pearly everlasting, I’d occasionally find people saying things like “Ew! I touched pearly everlasting and now my hands stink!” while I’d be surreptitiously rubbing it behind my ears. Your Santa Ana associations sound perfect, from this California girl’s perspective! Isbella…I predict you’ll be in the ‘pro’ camp for Sables. I miss the Santa Ana winds…I would always take twilight walks in when they were in full force. Love Sables, love your review. Thank you, Dusan! Why am I not surprised you love Sables? You know me all too well ???? 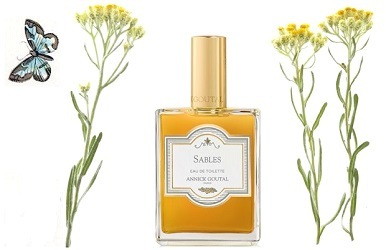 Sables is one of the few Immortelle fragrances I love. Even Dior’s Eau Noire (curried vanilla ice cream) leaves me cold. Thanks for the review! Such a descriptive review I cannot wait to try it. Veering more and more towards the spicer, woodier perfumes like Shalimar at the moment. Lovely for summer evenings. Lifestylelodestar: hope you like it…a must-sniff. Lovely review, Kevin. I love Duel but most other AG disappear on my skin pretty quickly, although I am pretty certain I have never tried this. I’ll have to give it a go. Ha ha! Sables won’t disappear. Butch: Sables has endurance…it’ll last you through the day.